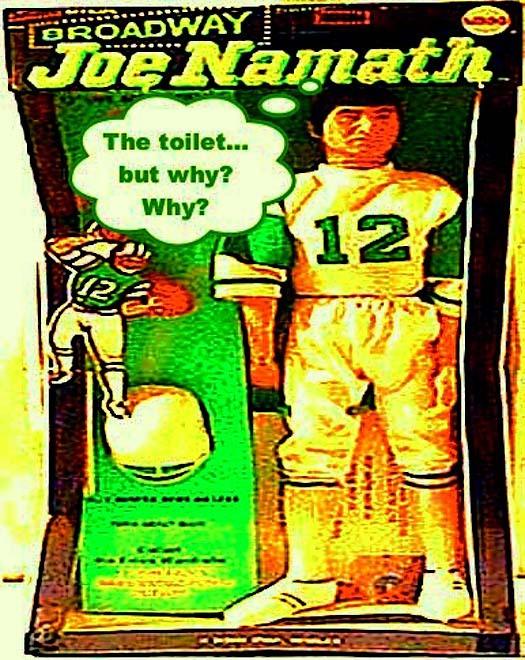 As with so many largely pointless childhood stories, the exact why and how of Mego Joe Namath ending up in the toilet are lost to time, blurred in a haze of retelling and embellishment, and perhaps a heavy dose of blame-shifting. I’ve always carried a sense that whatever bad happens to me, I am somehow deserving of it, usually because I can trace a path through the exact actions I took that led to the consequences. When it comes to arguments with siblings, those paths are usually pretty clear. With Mego Joe Namath, the clarity’s not there, perhaps due to my own desire to forget. Mego was a company that once largely had the corner on the action-figure market, manufacturing all of the DC and Marvel superhero dolls, most of which were crafted with identical bodies—the hands, feet, and heads the only variable parts—with clingy, fabric, footy-pajama-like costumes to provide the rest of the customization. Anyone familiar with Cartoon Network’s “Robot Chicken” has seen plenty of Mego toys. Mego Joe Namath, who had a decidedly different style of dress compared to the superheroes, was a birthday gift from my paternal grandmother. It was totally unexpected, given that she usually only sent cards with checks or cash for birthdays, and a Hickory Farms gift pack as a family gift at Christmas—something that, to this day, makes it mandatory for me to include summer sausage in my Christmas Eve festivities. Mego Joe Namath was also totally unexpected because I had zero interest in football—and may not have even known who Joe Namath was at the time. Broadway Joe ponders the great mysteries of memory and intent. I like to attribute my sense of confusion over the story of Mego Joe Namath to my grandmother’s penchant for revisionist history, as if some of her mojo got on that Joe Namath doll, and made it impossible for me to own up to the specifics of what happened. A refugee, along with my grandfather, to the U.S. of A. just prior to WWII, grandma squished and squashed the family history into something palatable for that era, and then for a later era, the story always holding too many contradictory elements for anybody who knew more than the small slice she was dishing up at any particular time. And, I should also note, I don’t know that grandma was the source of the stories. I just don’t know who else to blame. In Grandma’s telling, we came from a line of German barons, low-level royalty of sorts, but we were also Jews, dodging Hitler by changing our name from Schildberg to Schildbach. I’m not sure which part of the story is harder to swallow–that a Jewish family attained noble status in Germany, or that our family’s heavy Lutheran leanings were born of a conversion of convenience–a cover story that resulted in such a complete abandonment of our heritage that the family attended church–well, religiously–and my father became a pastor. We were Nazi fighters, or fighters of Nazis. Or perhaps we were communist fighters, or fighters of communists. And maybe, just maybe, we were Nazis fighting the communists, or vice versa. However it turns and churns, we were never whatever was bad. And whatever happened, the family got out of Germany at a pretty good time to get…so hooray for not ending up dead for some political or religious leaning or another. The shifts in my rememberances and interpretations of the Mego Joe Namath saga could also be attributed to my last memories of my grandmother. She had come to visit my mother’s home around Christmastime during my college years. Before I made it home for the holiday break, my younger brother had already sent notice that grandma was spending most of her time in front of the TV complaining—frequently about communists and gay people—and this was in the days before Fox News. I can only imagine what mainlining such misappropriated anger would have done for her, when a news story about the Soviet Union would send her into a grumble about how we don’t need communists on the TV at Christmas, or seeing Brian Boitano in Olympic trials would launch her into a confused rant about how “they” had accused one of my cousins of being gay—maybe she meant the United States Figure Skating Association, although that seems unlikely. At some point, I conflated these late memories of my grandmother with why she ever would have sent me a Joe Namath doll in the first place. I figured that maybe, in my early primary school years, she had become concerned because, along with my girly curly hair, penchant for art projects, and general lack of interest in sports, I carted around a dress-wearing teddy bear named Cindy. Grandma may have decided that the antidote to such anti-masculine behavior was a doll that played football. And, speaking of things I really don’t remember, I’m not sure where the teddy bear came from, or why I was convinced it was female and asked my mom to make a dress for it, but I suspect that my sister had a strong hand in all of it. It was also by my sister’s hand that Joe Namath ended up in the toilet. I’m sure there were numerous warnings leading up to the actual toilet incident. I just don’t remember the triggering event. It could have been that I snuck into her bedroom while she was in the shower, and played 45s on her portable record player. I thought maybe it had something to do with me stealing her Sunshine Family Farm chicken again, so I could make fart noises as I made it squeeze out eggs—but the timeline for that toy’s release placed it far too late to match up with Mego Joe’s trip to the pool. It may have been that I stole Sunshine Family dad’s sweater, so that Mego Joe Namath would have something to wear other than his football outfit—a likely possibility, given that, while Joe’s shirt went into the toilet with him, he was not wearing it. Chances are, the event that led to Joe taking the plunge was little more than my bragging about how grandma had sent me a present but hadn’t sent one to my sister…or some other antagonistic foolishness…singing an annoying commercial jingle over and over again, calling her names, suggesting she was in love with somebody…I could be pretty damn annoying with very little effort. I can’t remember if the event took place in one fell swoop, with my sister grabbing up the doll and accessories and dropping them all in the toilet, or if it happened in stages, with me refusing to give up whatever it was I was doing that was annoying her, as she dropped items of clothing into the toilet, one by one, finally plopping Joe in as the final measure. There is also the matter of just who hit the handle on the toilet, flushing as much as would go down—which I think was only Joe’s shirt, football, and helmet—maybe one of his shoes, too. Joe himself was spared the trip to the sewer by dint of his size, or positioning–an inability to navigate the crooks of the toilet piping. I have a vague recollection, obscured by the lies that took place in its wake, of staring down at Joe in the toilet after my sister stomped triumphantly out of the bathroom, evil grin on her face, or maybe with her standing right there, relishing my disbelief. And as I looked, and imagined having to fish him out of the toilet to clean and dry him off, and admit my sister got the best of me—that she had completed an unspeakable act I was sure she would never dare—I was filled with anger…anger that could only be redeemed with destruction. Joe would go down, a sacrifice to Mars, and I would blame it on my sister, pleading with my mother to punish her for the destruction of such a beloved gift. Truth is, from the time I got Mego Joe Namath, I was puzzled. What the hell did I want this for? But it was a toy, right? A gift? Something I obviously was supposed to want. And given my unnatural attachment to objects, I had to keep it. It had to mean something more than I could quite fathom. It was as important as all material things, as all toys I longed for…right? But I believe it was me who hit that handle, not only to get my sister in trouble, but because I was finally presented with a way to get rid of that weird, incomprehensible, whatever of a gift. The guilt of trying to flush him was roughly comparable to the guilt of not wanting him in the first place. Perpetually vexed by the tension between trying to accept and do what adults expected of me, and the desire to just melt down or blow up, I was a bit of a mess as a child…as I suspect all children are, in one way or another. Feeling that you want what others think you shouldn’t, and that you don’t want what they think you should, is a hell of a thing. So, Joe didn’t go, but he didn’t stay whole. And that became excuse enough for me to leave him behind…something incomplete I had an excuse to no longer play with. Back to teddy bears in dresses for me, with only a small lump of guilt for the subterfuge visited on Joe. And grandma, living several states away, never needed to know. This entry was posted in Childhood, Christmas, Faith, Mental Health, Psychology, Religion, Toys, Uncategorized and tagged Christmas, Faith, families, Fox News, Parenting, Psychology by jcschildbach. Bookmark the permalink.